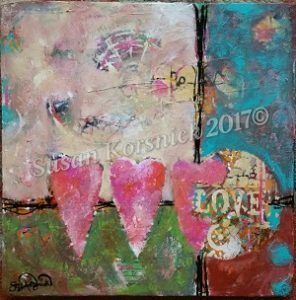 In the past few months, I’ve noticed a lot of hearts appearing in my artwork. Some resemble the ones we are used to seeing on Valentines and others are human hearts. A self-admitted over-achiever and perfectionist, I’ve spent years striving to achieve and please. Even my spiritual practice was based on getting in touch with my higher self. I confused “higher self” with “best self” and that’s where I made a big mistake. “Best self” is based on judgment and outcome; it always takes more to be my “best”. It’s exhausting and unobtainable. Logically, I know that but I always tried a little harder, did a little more, improved just a little bit. Be better. Where’s the love in that? Christine Mason Miller wrote in Bella Grace magazine, “Whether about to turn 20 or 80, we all only have so much time, so why not be in a hurry- to reach out to one another, however we can- and love them.” And before we do that, let’s take time to BE LOVE for ourselves- give ourselves permission to stop “doing” and start being. 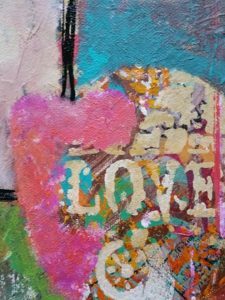 detail of Be Love, by Susan Korsnick. A recent health scare awakened me to the truth- it’s not as important for me to be my best self as it is for me to relax and be my authentic self. Just BE. It sounds so simple to do, doesn’t it? Just BE. I was humbled by the experience, to say the least, but there was a silver lining. As much as I have practiced a spirituality that connects me to my divine self, I needed a bolt of lightning (of sorts) to reconnect me to my human self. I don’t want to be that driven multi-tasker any more. I want to create more art, read more books, spend more time with people I care about, play, laugh, and savor every precious moment. It’s time to let go of judgments, outcomes, and anything else that takes me out of the present. It’s time to BE LOVE, starting with my self. I put my hand on my heart and promise to BE LOVE and allow that flawed, goofy, uniquely wonderful being who lives underneath to-do lists and expectations to come out and play and twirl in the light again. Once upon a time, there was a little girl with straight dark brown hair and big dark brown eyes. She loved spending her summers with her grandparents, Grampy and Nanny, in a small town in central Pennsylvania. Every morning, the little girl’s grandfather would quietly tiptoe into her bedroom to tuck her blanket under her chin and softly pat her leg before he left for work in the brickyard. To be completely honest, the little girl was rarely asleep when he came in but she kept her eyes closed and pretended anyway. The whiff of freshly percolating coffee and the whispers of her grandparents in the kitchen wafted up through the register in the floor. These soothing smells and sounds lulled her back to sleep. 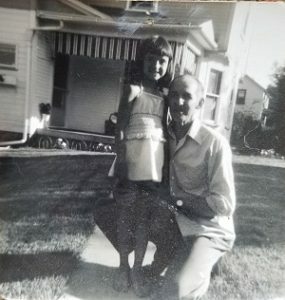 When Grampy got home, after long hours in the stifling heat of that factory, he would sit on the porch with the little girl and open his lunch pail. No matter how hungry he was during the day, he always saved her a bite of the chocolately dessert Nanny packed for him. In the early evenings, the little girl and her grandfather went for walks to Martha’s Park where Grampy pointed out picnic shelters he helped build or to Webb’s field where they would sit as still as possible and watch the deer feed. When they got home, Grampy would read on the porch while the little girl chased fireflies or bunnies in the yard with her sister. Weekends were spent with Grampy- picking veggies out of the garden, playing in the playhouse he made for her and her little sister, shelling peas, and doing other chores that never felt like chores. Nights were spent in front of the television, watching Lawrence Welk or Hee Haw while they played cards and ate dishes of chocolate ice-cream. Triple scoops! Sometimes they would watch the Three Stooges and laugh until tears streamed down their faces. Nobody else appreciated Larry, Moe, and Curly the way Grampy did. Fast forward a dozen years or so and the little girl is a married woman. She’s standing in an airport with her grandparents before she flies back to California to reunite with her Air Force husband. Her plane begins boarding and she begins hasty farewells because long good-byes lead to too many tears. She hugs Nanny. Then, she hugs Grampy. He gives her an extra tight squeeze and says, “I love you.” In over twenty years, he never said “I love you” to her. She began to cry uncontrollably, not because she needed to hear him say that but because she didn’t. She always knew she was loved… completely and unconditionally loved. Grampy (Albert Martin Marcinko) instinctively knew how to BE LOVE. And “being love” is the best kind of love there is. Here she is. The brown hair is turning gray and the brown eyes need glasses to read up close but she’s still the same tanned, barefoot little girl inside. She knows how important it is to be authentic and how important it is to BE LOVE… everything else takes care of itself.